ABC Coast FM's Annie Gaffney spoke with Beverly about her new book about dealing with itchy, scratchy dogs and how to take care of them naturally. This book starts with a wonderful quote by Mahatma Ghandi: “A nation can be judged by the way it treats its animals”. 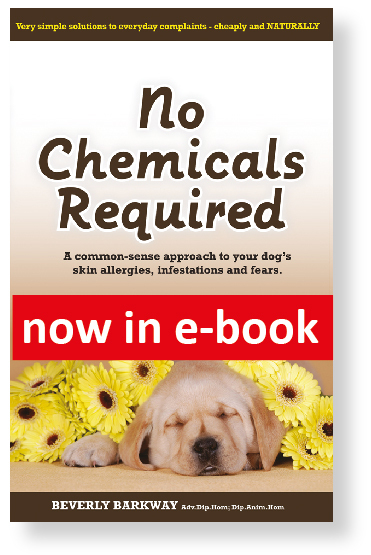 I must say that I totally agree with his statement, and with this in mind, I can recommend Beverly Barkway’s new book, which gives easy solutions to everyday pet problems such as fleas and ticks, without bombarding our best friends with nasty chemicals. Beverly tackles many different health issues with simple, non-toxic ways to deal with them, gives excellent information on diet and nutrition, as well as homoeopathic remedies and natural medicines. She also discusses social and emotional issues – fears, anger etc. with real advice on how to stop these behaviours and help to give your furry friends comfort and contentment. Beverly is a Classical Homoeopath, Animal Homoeopath, and is the owner/operator of two all-natural pet product companies, based here on the Sunshine Coast. The book is simple to read, and will be a valuable reference to keep on the bookshelf, helping you to give your best friend the best life possible. We don’t want chemicals on our food or in our gardens and we certainly don’t want them on our precious pets if we can avoid them. So what to do about fleas, rashes, mange and other skin conditions? And how about vaccinations? The answers to all this and more are contained in this small but information-packed book along with invaluable advice on subjects such as nutrition for dogs of all ages; doggy behaviour problems, including aggression; homeopathics, Bach flower essences and neem as eff ective natural medicine for pets; emotional wellbeing in animals; and all the things that can harm your best friend. Don’t just rely on your vet — take responsibility for your canine companion’s wellbeing.